We did it. 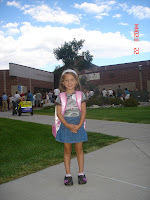 We dropped our baby girl off at school today. I knew it would be one of the hardest days of my life, and it proved to be all that and more. Her teacher came and took her from us, she disappeared into a sea of people; and that is about the last I saw of her until the school doors opened, and I began rushing the door and screaming her name as if I was some groupie at a rock concert. She looked back, gave me a wave, and walked through those school doors. She has been focused on kindergarten since she was 3. I've been dreading this day since I brought her home from the hospital. I used to stare at her while listening to a Twila Paris baby lullaby CD, and fret that I would never be able to protect her from every predatory word, thought and action that would come her way. I was forced to realize that she was and is not a gift to me like Jesus is. Her time with me is a gift. She is a blessing He shared, but she is His. Life's trials have taught me what a good thing that is, but somehow today the rubber met the road. I HAD to give her over in a way I've never had to do before. And before I knew it, the PTA's Boo Hoo party, that I so ridiculed, was suddenly a good idea. Not because I wanted to participate, but because I would do anything to get inside those school doors to be within the same walls of my baby girl. Scott and I left the party and walk outside the school to find her room. We just needed to get one last look at her. We're stalkers, I know. Unfortunately, her room was tucked away in a corner that was not at all accessible to the stalking parent. I know I have little to worry about, however. Rana is a stellar student; she longs to be obedient; loves and serves her brothers and us with eager anticipation and joy; she's very smart; and best of all has an awareness of Christ that does not go unnoticed. As I write about her, I realize how much there is to admire. She is remarkable in many ways, and I love her. Thank you, God, for that little blessing. I was wondering which one of my dear friends was going to be the first to post about kindergarten. I'm glad it was you, b/c your post is great, and very comforting, and I'm bawling my eyes out. I had a break-down last night. Taylor doesn't start until Monday. It seemed like just yesterday that I was sitting up in the waiting room of Plano Presby waiting for Rana to enter the world. I remember the week you left for Colorado, Rana and Taylor were crawling around my apartment in diapers, and I was so sad. OK, crying more now. Rana will do great and I know she'll be such a light to those around her. You and Scott look great by the way!!! Love you! You made me cry, too. I'ma go hug my girls. Great post! You're a brave Mom! I'm sooo not looking forward to that day for me. I know it was a gift from you. I have a counselor friend that thinks I really did myself in listening to it so much! Hey...I was looking at the pictures again and saw you marked out the name of her school. How did you do that, and I'm so glad you did. So efficient little mom. And by the way, where are the boys on this first day of school adventure? Velvet, you love her soo much, it's beautiful. She is going to be such a light in that school, just like her mama still is. I am crying now. What the heck Velvet. My daughter is only 3mths old and now I have to think about her leaving me to go to school. I hadn't really thought that far yet, but now am forced to. It feels just like yesterday that precious Rana was born. Your sweet description just proves how fast our time flies! yikes....good thing you are journaling here to share and bless us all with your beautiful faith! It is comforting to know we have a spiritual protection when we can't be with our loved ones physically. Separation doesn't just happen at the first school day, it continues thru life my dear...sad but we get used to it, or get stronger one. How is your mom? I miss you. I sent my "last baby" off today. You think the first one is hard--wait until the last--it is a whole different kind of sadness. I've got pictures on my blog. Rana looks like a "professional kindergartener!" She'll do great--the Lord will see to that.